Crispy, crunchy, crackling, slightly toasty, irresistibly delicious slow roasted sweet peppers. They came about because I couldn't bring myself to toss out the sweet red bell peppers that I bought at the farmer's market a week ago and which I left on the counter to shrivel up. They weren't spoiling, but they weren't crisp enough to use raw in salads or as crudites. I didn't think they would be much good for roasting or sauteing either. So I figured that since they were already well on their way to becoming dried peppers that I would help them along. Then I remembered my experiments with slow roasted chile peppers last year and decided to give these peppers the same treatment. The rats have given the cucumbers something of a reprieve so I got to harvest a fair number of Green Fingers Persian cucumbers and even a few Tasty Green Japanese cucumbers (not pictured this week). I think the rats got bored with the cucumbers or they got too lazy to climb the tower that the cucumbers are growing up and decided to graze in the patch of Slenderette bush green beans. There's the total harvest of the Slenderettes at the bottom of the photo, it should have been three times that much judging from the nubs that were left on the plants. 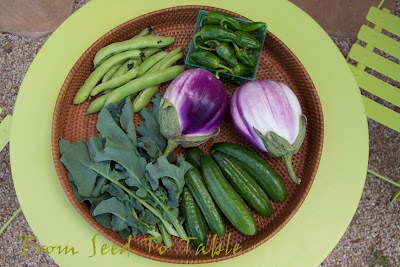 The beans in the center of the tray are Musica pole beans, one of my favorite varieties of green beans. 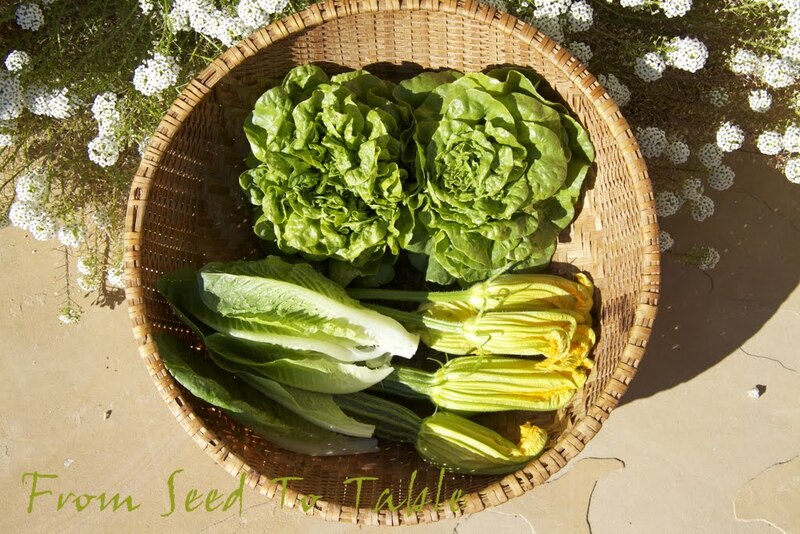 They can be picked when even more mature than these and still be tender and sweet. The bigger beans are fabulous slicked with a bit of olive oil and grilled or roasted, and served with a dash of coarse sea salt. I harvested the beans when still relatively young because there were signs of raiding... The beans shown below were cut into 3 or 4 pieces and then simmered with fresh chopped tomatoes (not from the garden yet) and some sauteed sweet onions and garlic. I made one of my husband's favorite summer dishes last week - a gratin of zucchini and chard. 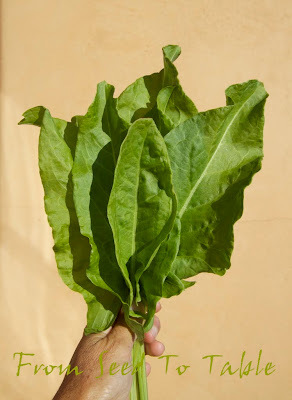 Here's the handful of sorrel that the recipe also called for. It was definitely time to harvest the head of Charming napa cabbage that survived its struggle with the competing oak tree roots, managed not to bolt along with the rest of the surviving cabbages, and then seemed to form a head in the blink of an eye. The trimmed head came in at a whopping 5+ pounds! Slaw, slaw, and more slaw. 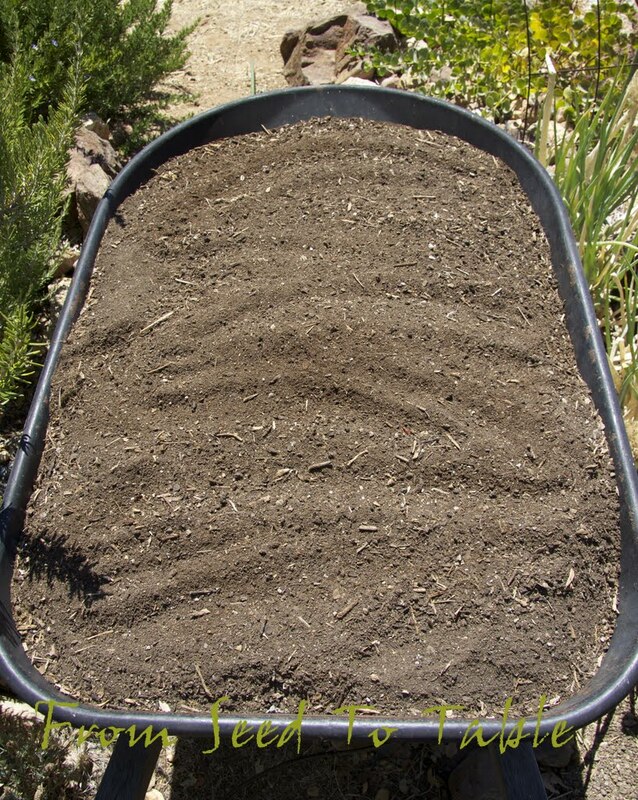 but I got a wheel barrow full of fantastic compost out of the deal. 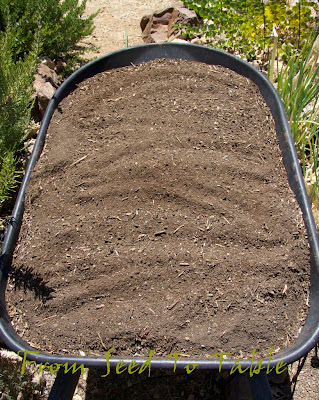 I used old potting soil and the chunky bits of my sifted compost to fill the bin. A lot of worms ended up with the potatoes and they did a great job of breaking down the old soil. It was a good week of harvests, much of which never made it in front of the camera. The fridge is stuffed with veggies so the only thing I'll have to buy at the farmer's market this week will be tomatoes (still not ripe!) and fruit. Musica pole green beans - 3 lb., 1 oz. 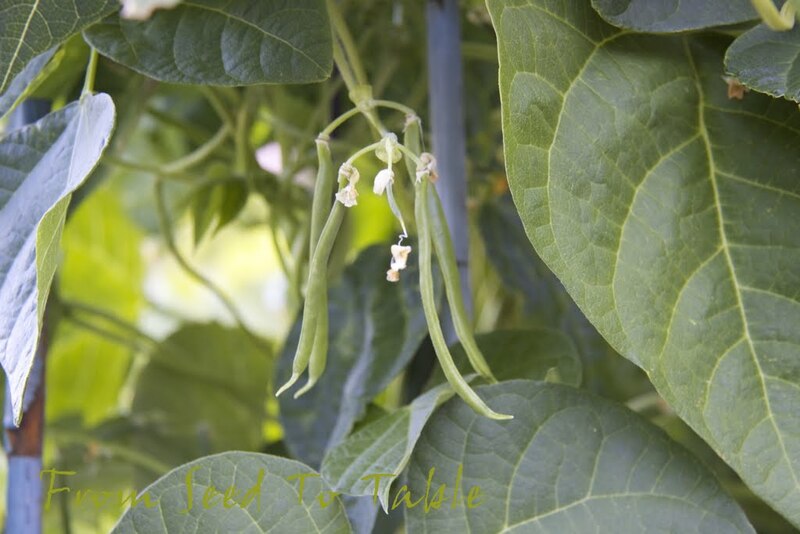 Slenderette bush green beans - 4.6 oz. Piracicaba broccoli - 1 lb., 7 oz. Di Sarno Calabrese broccoli - 2.8 oz. 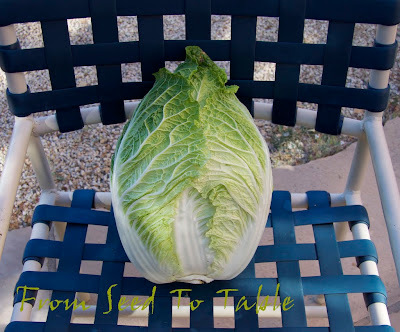 Charming napa cabbage - 5 lb., 3.4 oz. Dorato di Asti celery thinnings - 7.5 oz. Golden Chard - 1 lb., 8.6 oz. Green Fingers Persian cucumbers - 2 lb., 1.6 oz. Tasty Green Japanese cucumbers - 1 lb., 6 oz. Diamond eggplant - 1 lb., 11.9 oz. Orient Express eggplant - 4.8 oz. Rose du Var garlic - 9 oz. S&H Silver garlic - 9 oz. Pimento de Padron peppers - 12.3 oz. 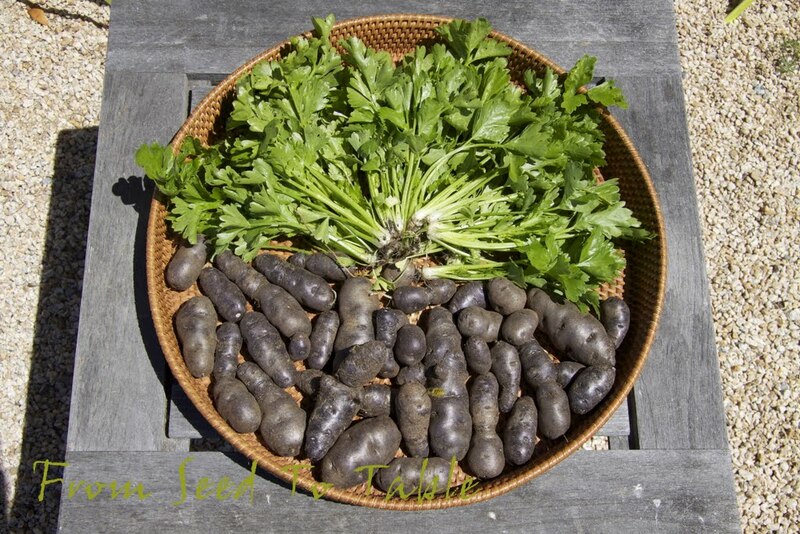 Negresse potatoes - 2 lb., 5 oz. Zucchini - 2 lb., 6.6 oz. Zucchini blossoms - 1.1 oz. The harvests for the week were - 24 lb., 10.9 oz. The harvests for the year have been - 290 lb., 11.2 oz. At last, the first ripe tomato! Meet Katja, the only tomato to ripen so far this "summer". No wait, I take that back, I picked one little Galinas cherry tomato that never made it before the camera or onto the scale. 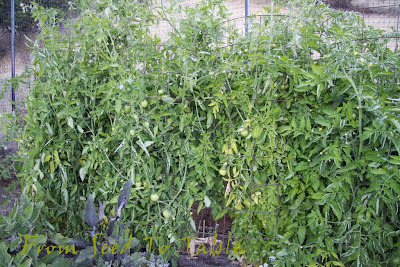 But don't hold your breath waiting for photos of the tomatoes to come, the rest of them still pretty darned green. Here's another first from the garden this year, Rosa Bianca eggplants. And a sort of first, the first ever August harvest of fava beans from a volunteer plant (what the damned rats left for me). Also on the tray are Green Fingers Persian cucumbers, Piracicaba broccoli, and Pimento de Padron peppers. Green Fingers Persian cucumber is my new favorite cucumber. It's smooth skinned when young and very tasty. These are a little larger than what you might find at the store. 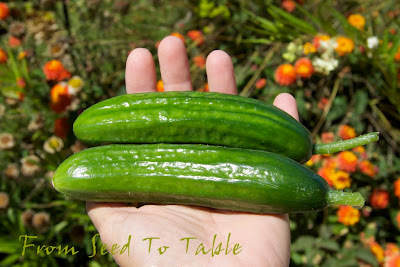 I first tasted Persian cucumbers from Trader Joe's and knew that I had to try growing them myself. No seediness here, even when they get larger. Aren't they beautiful. 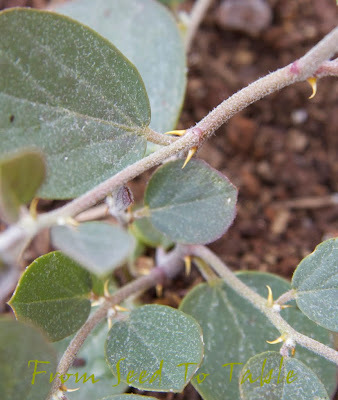 Unfortunately, the rats have developed a liking for these and I'm afraid that I'm going to have to pull the plants out now that the vermin have figured out how to get past the defences that I put up to protect the plants. Oh well, at least I can buy my second favorite cucumber, Japanese cucumbers, at the farmer's market. Ah well. I have so many other things to be thankful for. Gotta keep this in perspective. I surely won't starve because of the marauding vermin. Thanks for letting me vent my frustrations here. Piracicaba broccoli - 9.6 oz. Rosa Bianca eggplant - 1 lb., 13 oz. 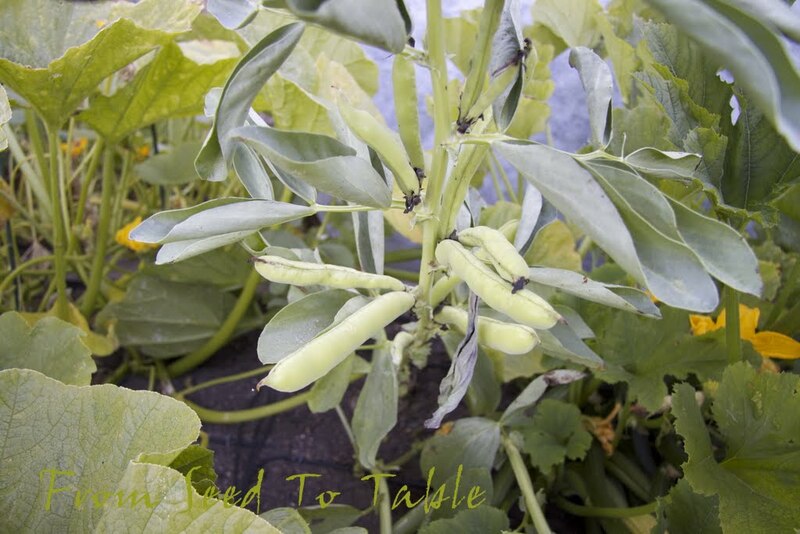 Fava beans - 7.6 oz. 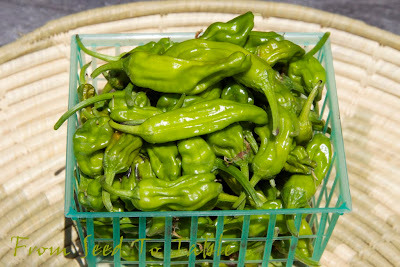 Pimento de Padron peppers - 5.9 oz. Katja tomato - 6.8 oz. Zucchini blossoms - 4.2 oz. The total harvests for the week were - 9 lb., 11.9 oz. The total harvests for the year have been - 266 lb. Time for another garden tour! Last month the Marina di Chioggia squash vines were just starting to crawl out of their bed. Look at them now, they're nearly blocking the main path and would fully block the path and the gate if I didn't push the vines aside and around the corner of the bed. The colder than normal weather that we've had this summer doesn't seem to be bothering the squash, they're healthy and blooming like crazy and have been setting a good number of fruits. 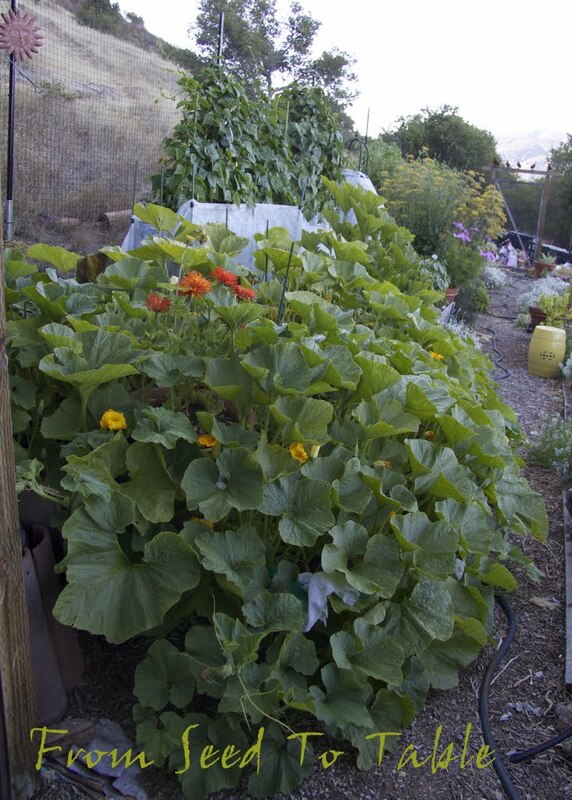 The biggest problem in the squash patch has been rats (doh, what else could it have been this year). 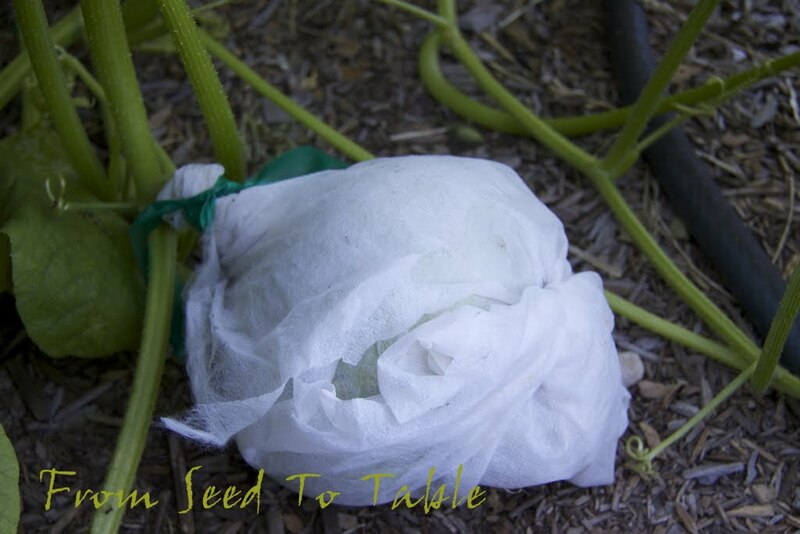 This is what I have to do to keep the squash from disappearing as soon as the female blossoms open. At the end of the day I wrap the blossoms that opened that day in a piece of row cover fabric and tie it to the stem and tie the other end closed. So far, so good, most of the squash seem to have been well pollinated and the wrapped squashes are growing, but I'm keeping them covered as long as possible and I'm keeping those rat traps set. 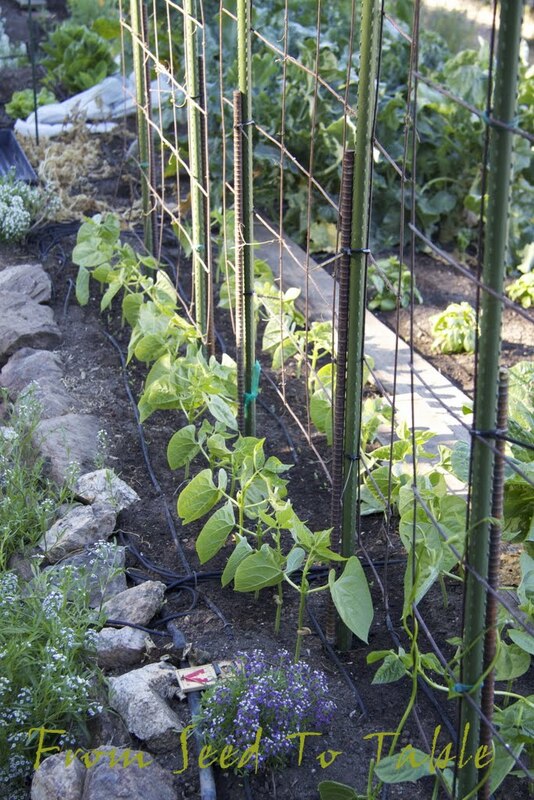 The pole beans have grown to the tops of their trellises and beyond. The row cover around the base of the plants is still in place to make it difficult for the you-know-whats to get easy access. 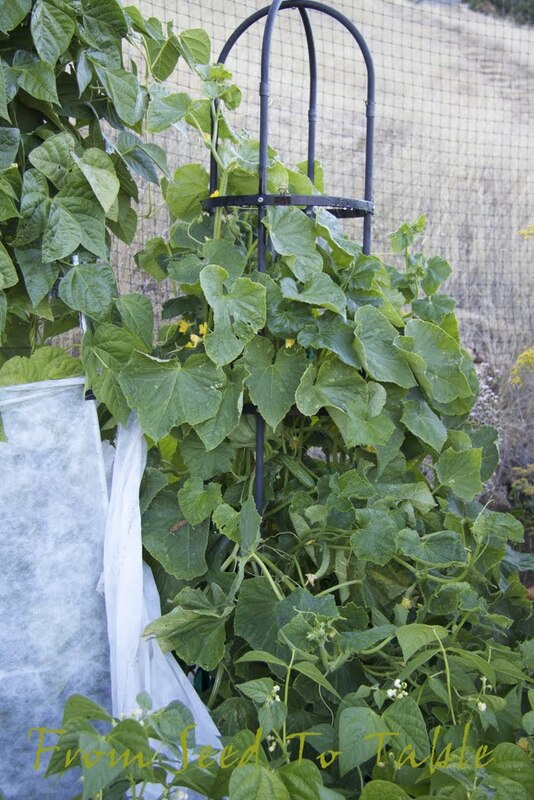 The cucumber plants growing up the tower on the right are also swathed in row cover for the same reason. The Musica snap beans are setting and seem to be sizing up ever so slowly - it seems like I've been watching these little beans for weeks now. They need to get much larger, don't be looking for a bean harvest here next Harvest Monday. The bush Slenderette beans haven't been disturbed by the furry pests, but you can see one dead plant which had its stem girdled by sow bugs, always a problem in my garden. 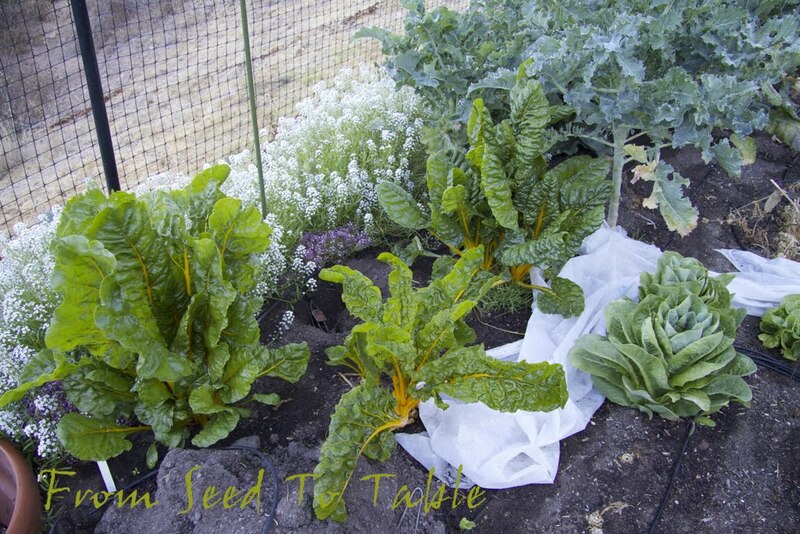 I spread sluggo plus in the sow bugs favorite hiding places and sprayed these plants and the rest of the bean plants with Spinosad so that any other bugs that decided to munch on them would be goners. I thought I would be harvesting these beans by now and certainly earlier than the pole beans but they've barely started to set beans now. 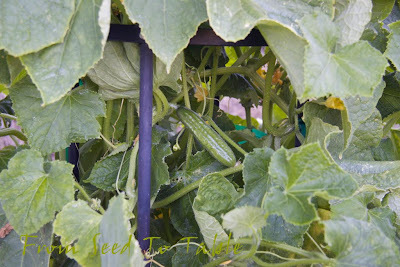 I uncover the cucumber plants during the day so that the numerous bees have easy access. Bee keeping has become hugely popular around here lately and I've noticed that my garden is full of them. The row cover protection has really helped to keep the baby cucumbers from disappearing, I'm finally harvesting cukes on a regular basis. The Green Fingers Persian cucumbers (that's one below) seem like they are going to be fairly prolific. 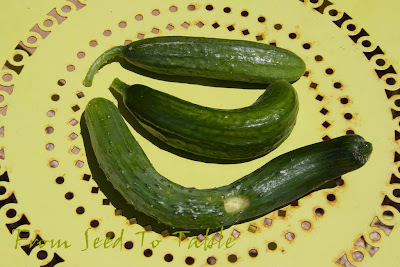 The Tasty Green Japanese cucumbers are less prolific but I'm getting enough to keep me happy. I'm not particularly interested in making pickles so small production of a great tasting fresh eating cucumber is fine with me. 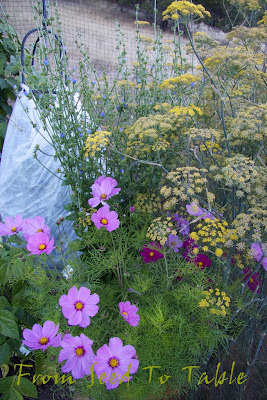 This corner of the bed is dominated by the Red Florence fennel which is in full bloom, a pot full of cosmos, and a blooming radicchio. 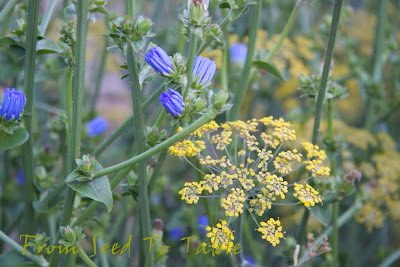 The radicchio blossoms are a lovely blue. The flowers close up at night and reopen when the sun comes out. This photo was taken before the sun came up over the ridge so the blossoms are still closed. Solanums are in the next bed. 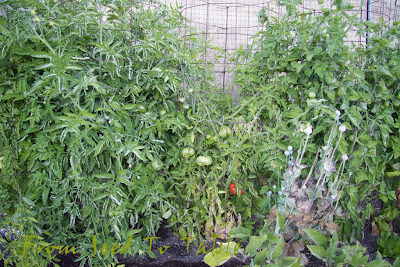 From left to right, two towers of Amish Paste, one of Gigantesque, and one of Black Krim. 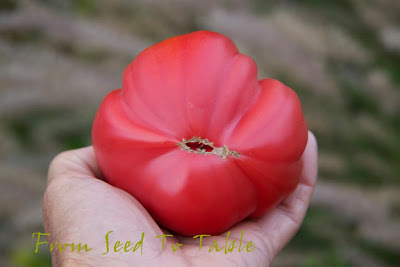 Amish paste is a new tomato for me (thanks for the seeds Thomas!). Nothing ripe there yet but the plants have set numerous good looking fruits. Gigantesque has been a very reliable producer of large and very tasty beefsteaks, but even it is struggling with our cold summer this year. Black Krim is another newbie in my garden. 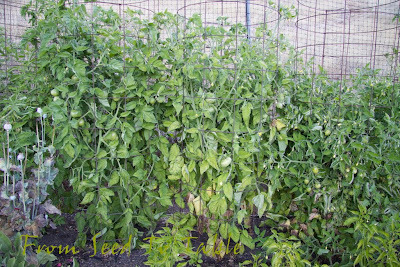 It is a cold climate adapted variety also and so far it seems to be keeping pace with the other cold climate adapted varieties that I'm growing - setting fruit but nothing ripe yet. There's the same Black Krim on the left again, then Katja, then Black Trifele. 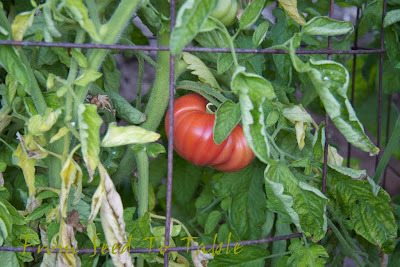 Katja is back for a second year in my garden and is producing the first ripe tomato this year. Last year my first Katja was harvested on July 14 and I harvested 7 pounds by the end of July. So, why are my tomatoes so late this year? 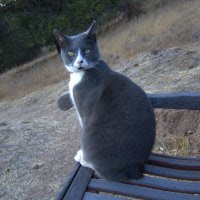 It can't be explained by the cooler than usual summer weather this year, we had an unusually cool summer last year as well. 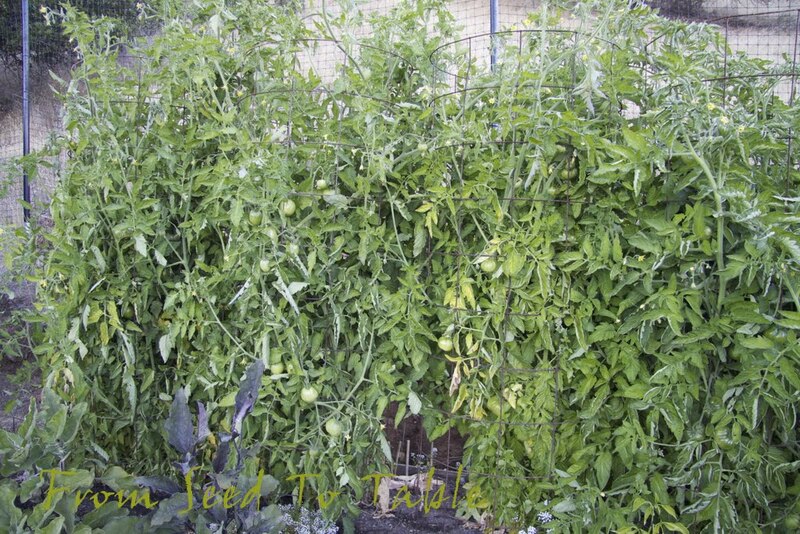 No, the difference is that I planted my tomatoes earlier last year and I enclosed the cages in a clear plastic cover to create a greenhouse effect. It surely made a difference. Next year I'm going to go to the trouble of that method again. 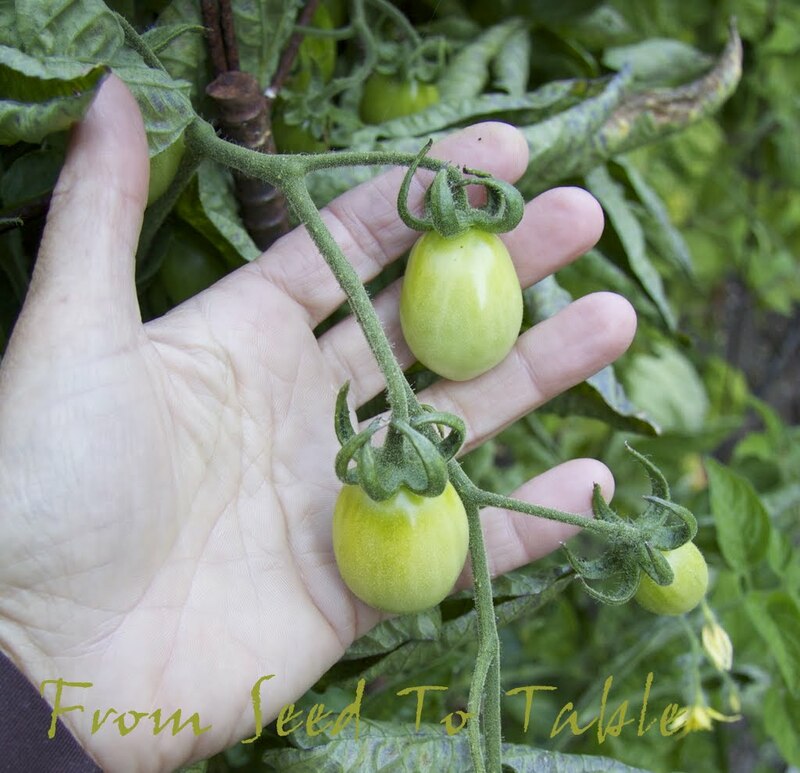 It has been driving me crazy to see the pounds and pounds of ripe tomatoes harvested by other bloggers this summer while my tomatoes hang there like little green rocks. On down the row - Black Trifele again, Chianti Rose, and Fiaschetto. All Three of these are new varieties for me this year. Black Trifele was purchased on a whim, I had heard that it is a good cool climate variety so I bought a plant when I saw it at a garden event. Chianti Rose is a Brandywine crossed with another unknown tomato and is also supposed to be a good cool climate producer, however it isn't really living up to that reputation in my garden so far, it was the last to set and the fruits are few. The Fiaschetto is a total flyer, it's a rare heirloom from Puglia, not necessarily know for being good in a cool climate, but it surprised me by being one of the first plants to set fruits. Here's a few of the Fiaschetto fruits, it's supposed to be good for fresh eating, sauces, canning, and drying - an all purpose roma type tomato. 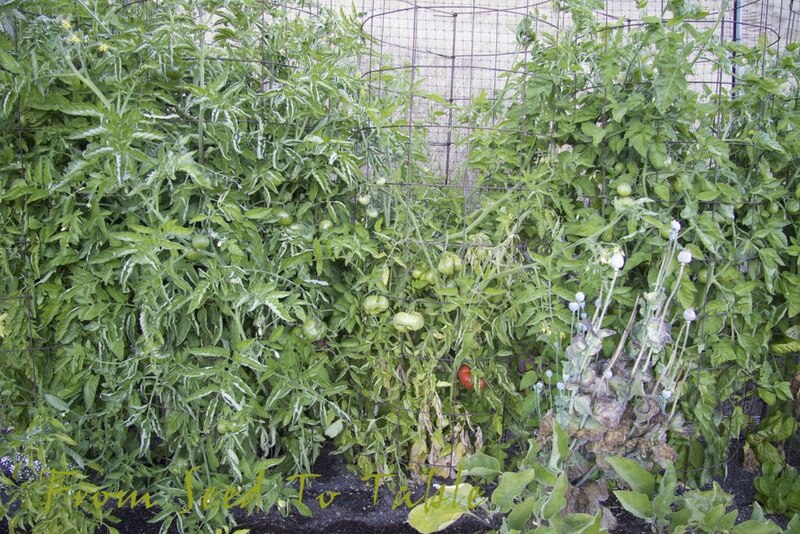 It also seems to be very productive, the plants (I squeezed two into one cage) are covered with fruits. 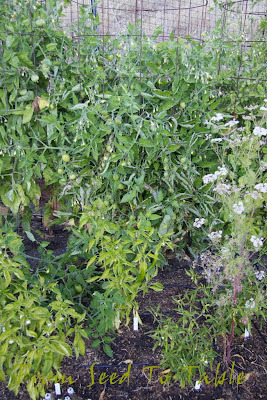 Here's another shot of the Fiaschetto - you can see the tresses of tomatoes with more tresses of flowers. It's a smaller plant, supposedly determinate, but I think it's more semi-determinate. 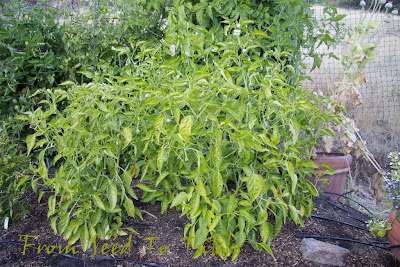 In front are a few pepper plants. The peppers are rather disappointing this year, only marginally better than last year. 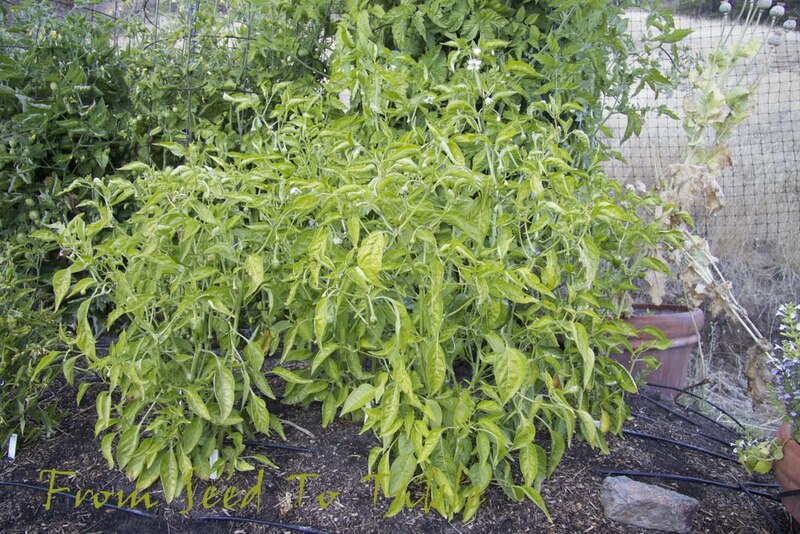 I'm not sure if there is too much root competition from the tomatoes or if the weather has just been too damned cold, or perhaps they are infected with a disease or a combination of all those problems. 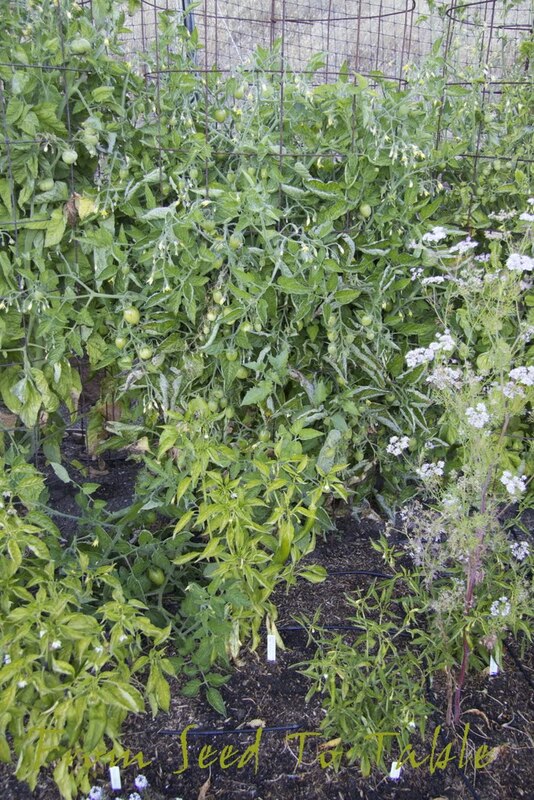 The cherry tomatoes are at the end of the row. On the left is Galinas, a sweet yellow normally vigorous and highly productive favorite. This year it is short and reluctant to produce. However, there is one tomato buried in the foliage in the back that is actually starting to ripen - I hope it's tasty. 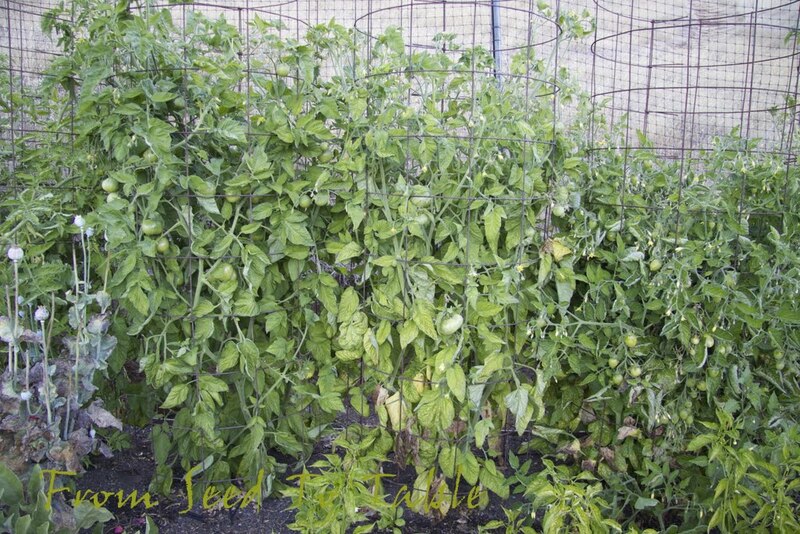 I squeezed two Aunt Ruby's German cherry tomatoes into the cage on the right. Last year my one plant turned out to be the wrong color, still tasty but not true, so this year I doubled my chances of getting a plant that is true to type. Here's a few of the Aunt Ruby's. It's a green tomato, but these are still too green. My favorite green frying pepper, Pimento de Padron, is growing in front of Aunt Ruby's. These plants started off well but have stalled. 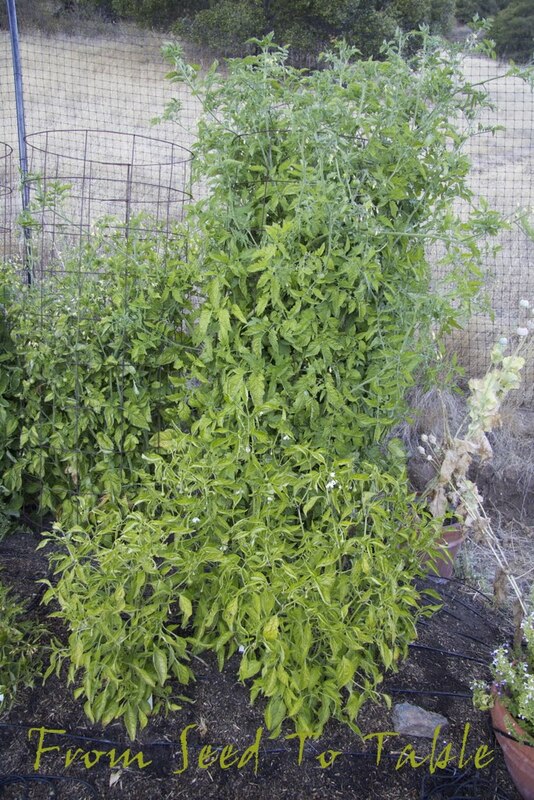 Same problems as the rest of the pepper plants... sigh. The eggplants are in the same bed as the tomatoes and peppers. 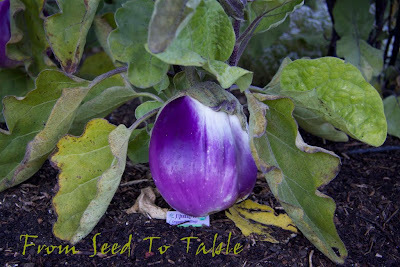 I've posted photos of the Diamond and Orient Express eggplants that I've harvested lately. Here's the other two varieties of eggplant that I'm growing but haven't harvested yet. This big beauty is Rosa Bianca. You can see that I'm growing "store bought" plants for this variety, actually all of my eggplant other than Diamond. 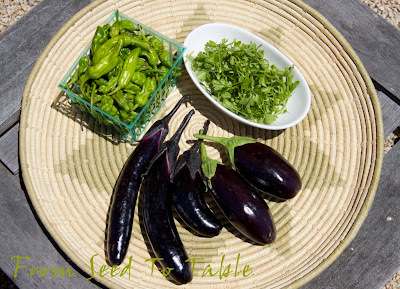 When I screwed up growing my Diamond eggplant seedlings I decided to supplement with some seedlings from a couple of local organic growers. I didn't really think that the Rosa Bianca would do well here because of the cool summers that we typically have, but this beauty is doing just fine in spite of the even cooler than usual weather. I've got two plants and each one has a good sized fruit even though the plants aren't very large. 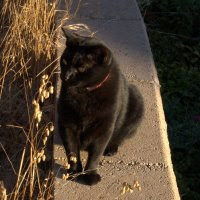 The other varitey that I haven't harvested yet is Black Beauty. This plant has a few fruits that seem smaller than they should be and the other Black Beauty plant hasn't set anything yet. On to the next bed. 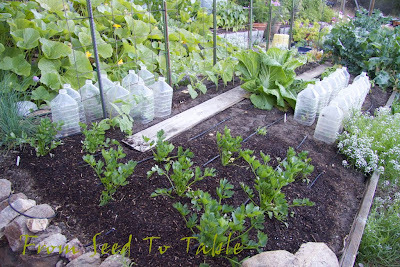 The Diamante celery root in the foreground is growing slowly but steadily, right on schedule. I don't expect to harvest any of these until late fall or early winter. 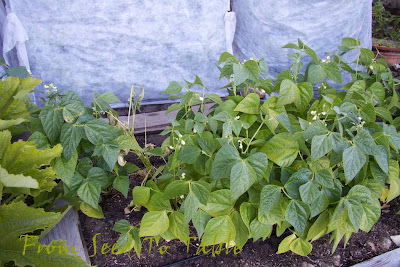 There are more varieties of beans under the water bottle cloches. I originally had the beans under floating row cover but the sow bugs found that to be a cozy situation and I lost a number of seedlings to them. When I removed the row cover and got some replacements to germinate then the rats took over and the seedlings started to disappear during the night. Now I cover the youngest seedlings at night and remove the cloches during the day. 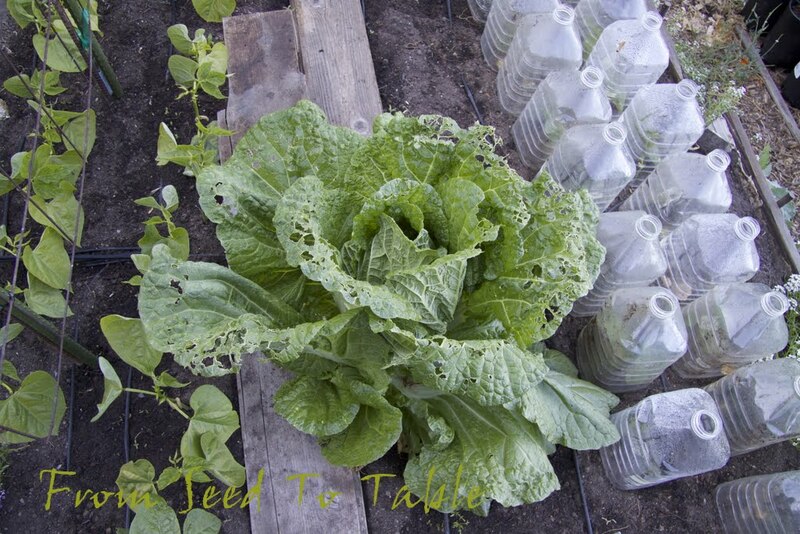 This is one surviving Charming napa cabbage from my original spring planted patch. The plants here struggled to get enough water and nutrients because of invading oak tree roots. After I dug the roots out of the surrounding parts of the bed the cabbages started to take off and then promptly bolted, but this plant didn't show signs of bolting so I left it and it is forming a head. It looks ragged because the birds have been pecking at the leaves but the central head seems to be fine. I think I should harvest it soon. 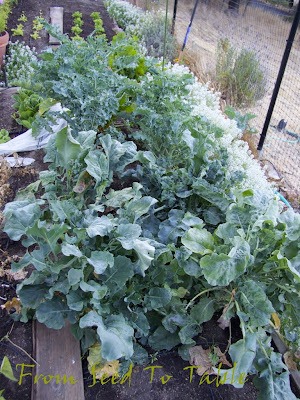 The oak roots got far enough down the bed to slow down the broccoli also. The Piracicaba managed to grow and produce a respectible amount of shoots, but now that the oak roots growing in this direction have been severed the plants are making a big comeback and are producing a lot of new growth. 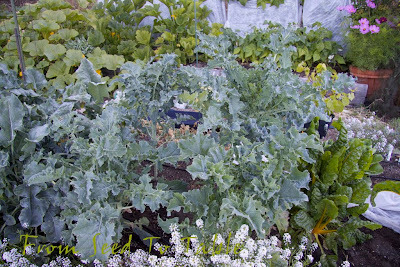 Even the Calabrese broccoli that I was so disappointed in because it was runty is starting to grow. The Golden chard is making a comeback after its own battles. I lost one to a gopher, but hey, I didn't need 4 plants anyway. 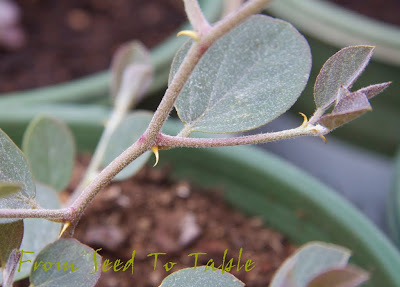 Then the leaves started to get powdery mildew and at the same time the aphids and ants moved into the succulent new leaves. I rid of all the nastiness and trimmed the plants down to just a few tiny new leaves. Once the worst of the aphids were gone and the newest growth became more exposed the beneficial bugs got rid of the few lingering aphids. There's a couple of rather tough looking and on their way to bolting lettuces on the right - chicken snacks. 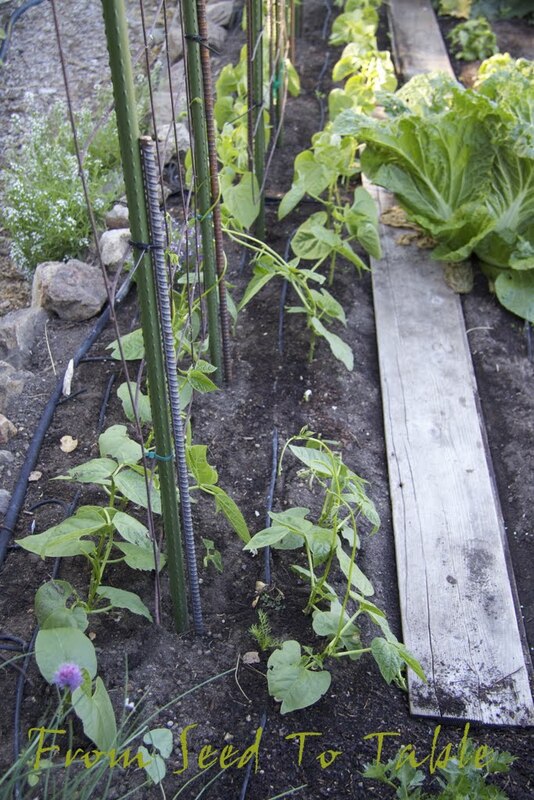 Here's the uncovered Neckarkönigin pole snap beans. 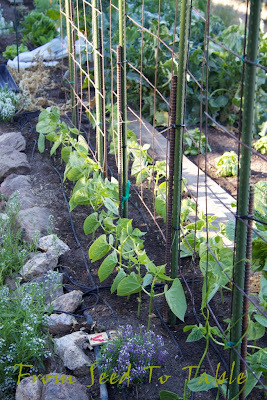 There's a few gaps thanks to munching rats, but what's left should provide me with enough green beans to get me through the fall. The Stregonta borlotto beans should provide plenty of shelly and dried beans this fall is they are spared. The bulk of the fall vegetables are destined for the final bed. 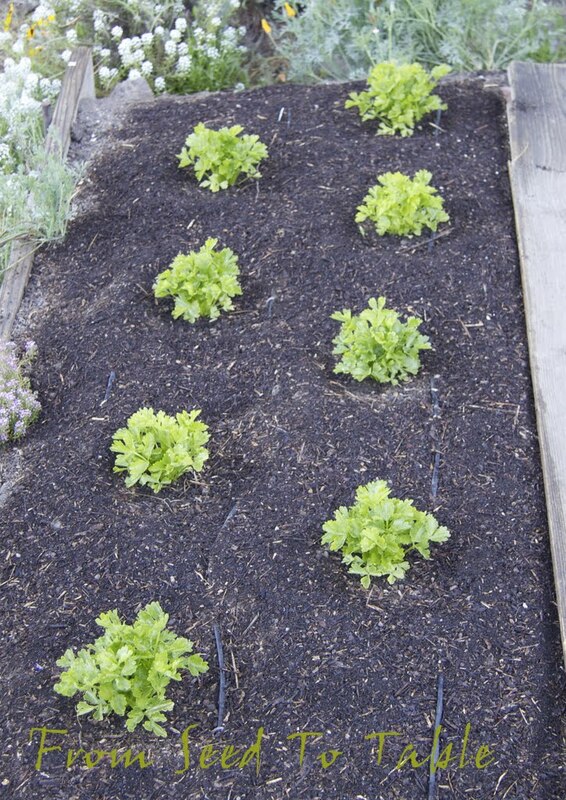 So far I have a patch of Dorato di Asti celery going. 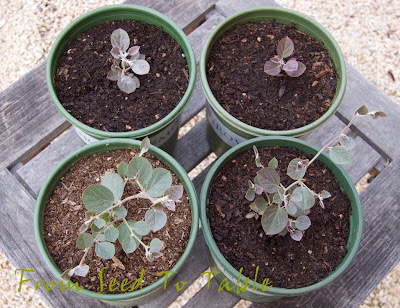 I've got seedlings of fennel, beets, and napa cabbages that need to be planted out but in the meantime I tried to slip in a quick planting of amaranth greens but those have been struggling. 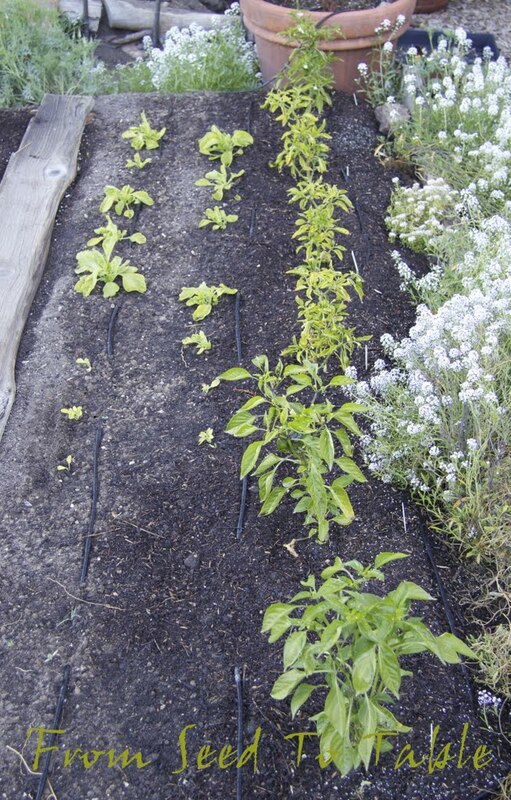 I also slipped in a few extra pepper plants to see how they would do - bleah, not so good so far. My efforts at peppers this year and last year have been a huge disappoint. I hope that we get our usual warm fall weather to give them a boost but I'm not counting on it. Well, that's it for the August garden tour. Thanks for stopping by! Harvest Monday is here again. 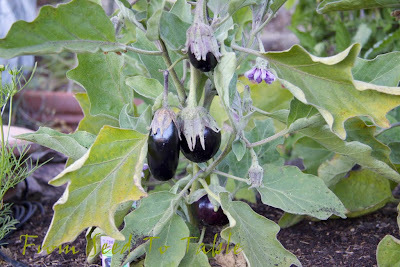 Still nary a ripe tomato to be found in the garden but the eggplant is starting to produce so there is something other than green veggies to show. This is a platter of Orient Express Japanese eggplant and Diamond eggplant. 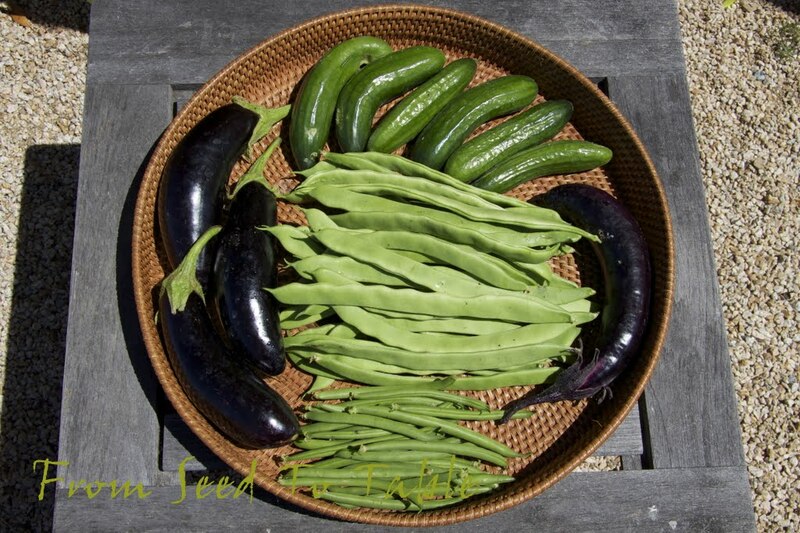 The Japanese eggplant have beautiful deep purple caps and the Diamond have green caps. Both varieties are seedless at this this stage of development. Last year I grew a Malaysian Long Red eggplant which was prolific, beautiful, and very tasty, but quick to develop seeds. I think I prefer the less seedy Japanese variety. I pan fried slices of the Diamond eggplant and then served it topped with a chopped tomato salad seasoned with capers, olives, chopped dried aji peppers, marjoram, basil, mint, and garlic and grated ricotta salata cheese over all. My eater in chief said it was a keeper. Last night I used the Orient Express eggplant in a stew that is similar to Ratatouille but with green Shishito peppers instead of sweet red peppers and I seasoned it with pomegranate molasses and chopped dried Espelette peppers. That was another winner. Here's the first two Green Fingers Persian cucumbers and one rat nipped Tasty Green Japanese cucumber. I think the Persian cucumbers rival the Japanese cucumbers for sweet seedless crunch. The cucumbers have been going into my lunch salads. Piracicaba broccoli - 12 oz. Di Sarno Calabrese broccoli - 1.3 oz. 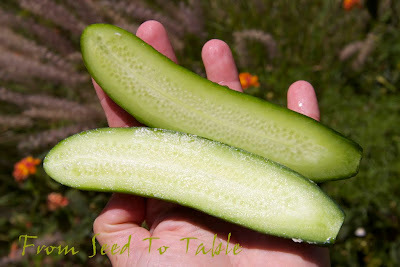 Green Fingers Persian cucumbers - 3.8 oz. Tasty Green Japanese cucumbers - 2.9 oz. 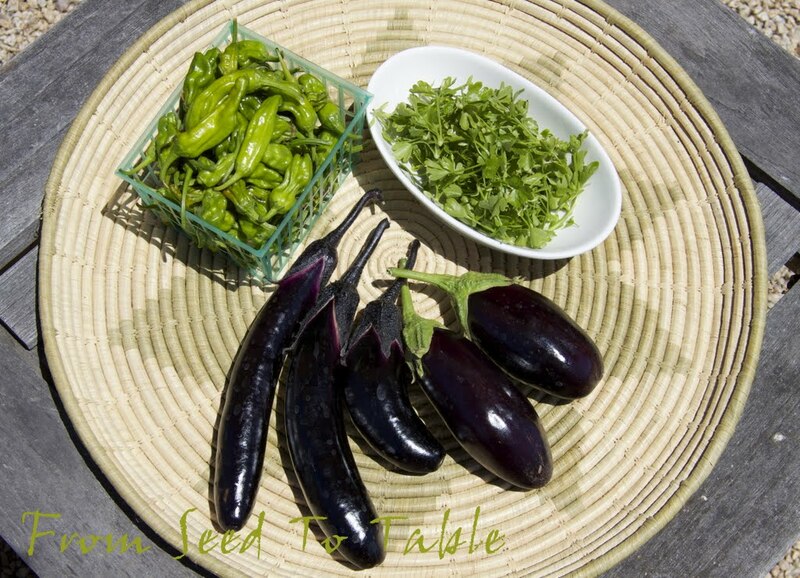 Diamond eggplant - 1 lb., 10.2 oz. Orient Express eggplant - 15.6 oz. Sweetie Baby Romaine - 1 lb., 11.3 oz. Zucchini - 1 lb., 12.1 oz. The total harvests for the week were - 7 lb., 15 oz. The total harvests for the year have been - 256 lb., 4.35 oz. 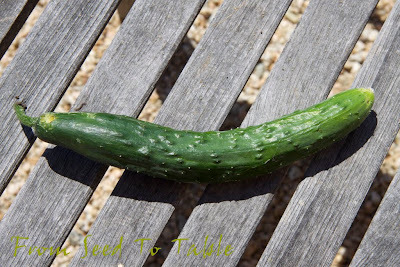 I managed to keep the rats out of the cucumbers long enough to get to harvest one of the Tasty Green Japanese cucumbers, although one of them did manage to take a nibble out of the stem end. But I got the rest of it and it was tasty! 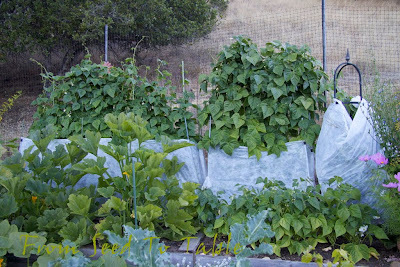 I've been wrapping the cucumber plants in row cover at night and that seems to be keeping the rat damage to a minimum now. The boogers were eating the cucumbers as soon as the female blossoms opened. Here's the last of the Garden Babies butterhead lettuces and one bolting head of Sweetie Baby romaine, the romaine stays sweet even when it starts to bolt. Oh, and there's some zucchini and their blossoms in there as well. Piracicaba broccoli - 8 oz. Dorato di Asti celery thinnings - .4 oz. Tasty Green cucumber - 6 oz. Diamond eggplant - 5.1 oz. 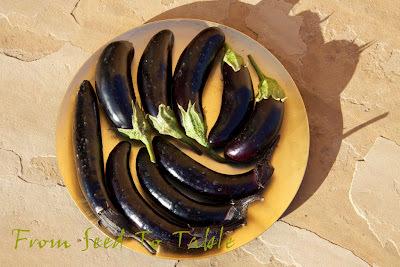 Orient Express eggplant - 5.5 oz. Garden Babies butterhead lettuce - 10.1 oz. 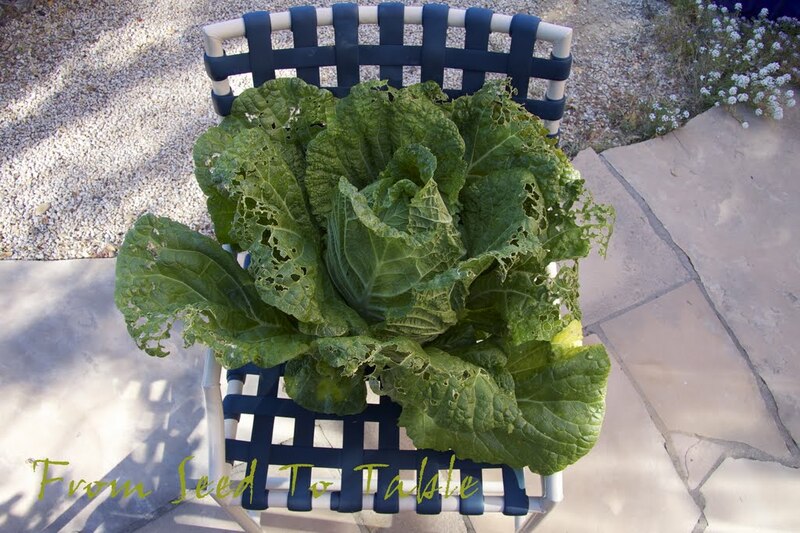 Sweetie Baby Romaine lettuce - 3.4 oz. Pimento de Padron peppers - 11.1 oz. 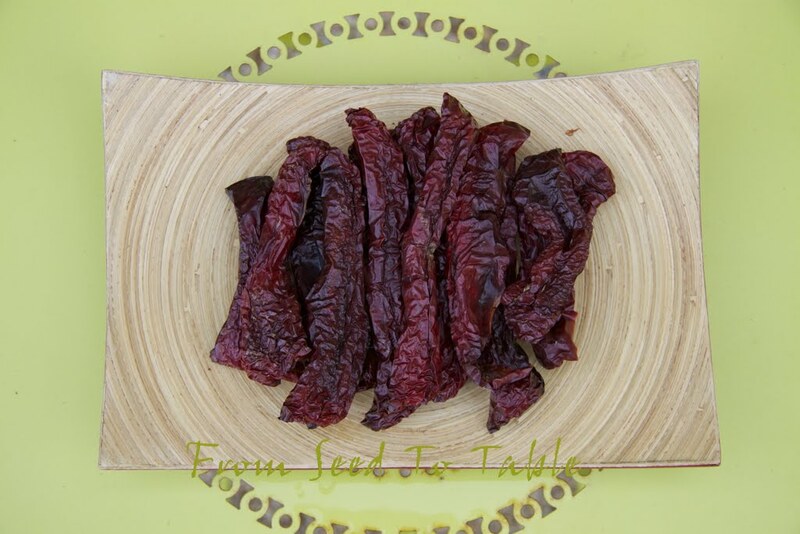 Shishito peppers - 5.4 oz. Zucchini - 2 lb., .6 oz. Zucchini blossoms - 4 oz. The total harvests for the week were - 5 lb., 14.2 oz. The total harvests for the year have been - 248 lb., 5.4 oz. Oh, and this doesn't exactly count as a harvest, but I was able to cull 14 individuals from the local rat population in the last week. That's exactly half the count from the week before. Are there fewer out there or are they just getting smarter? I think it's finally safe to unveil the latest additions to my collection of caper plants. 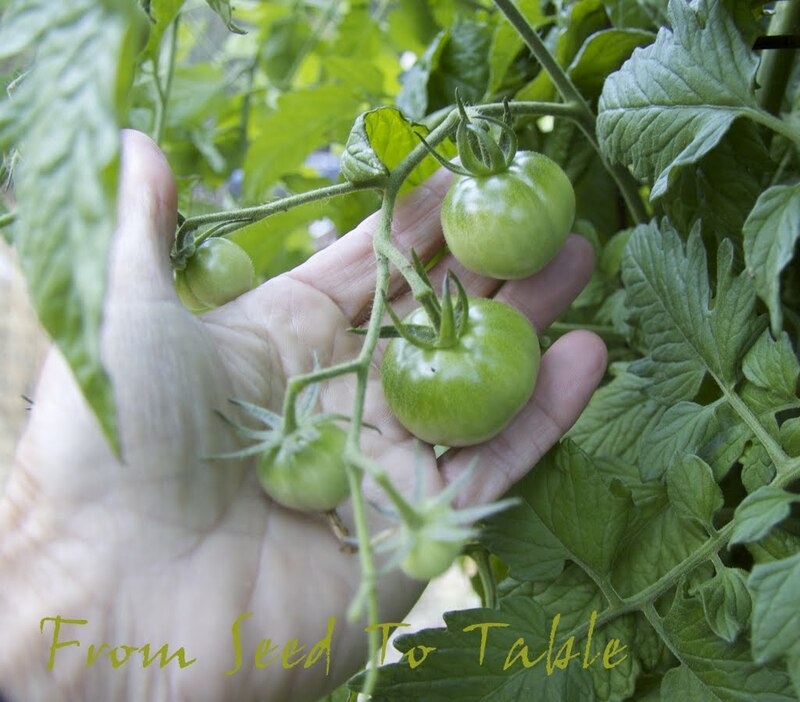 It was a long hard road from seed to seedling this time around. Last fall I sowed 3 6-packs with 2 seeds in each cell for a total of 36 seeds sown. These four hearty survivors are all I have to show for my efforts. 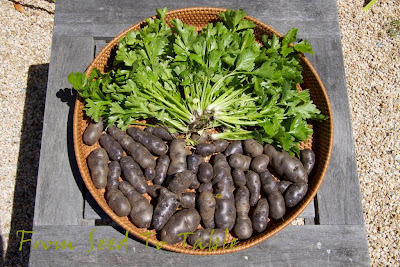 My first mistake was to put the sown pots in a spot that wasn't as protected from the rain as I thought and some of the soil was splashed out of the cells. I didn't seem to lose too many seeds and come spring when I moved the pots to a warm sunny spot a lot of seedlings started to emerge, even in the cells that had lost a fair amount of soil. Then the little seedlings started to disappear, I couldn't figure it out, birds perhaps? I put the pots in a spot where I thought the birds couldn't get to them. The losses continued and didn't stop until I put the pots up on a table. I stopped blaming the birds, the seedlings were in plain sight of the birds and they weren't touching them. As it turns out, those losses were the first indication of the huge problems that were to come from an explosion in the local rat population. But the rats weren't entirely to blame, the table top turned out to be a bit too warm and sunny. 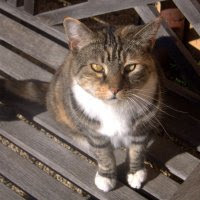 We had a rather novel weather event for this year - a mini heat wave! And, duh, I didn't water those poor little babies enough and a bunch of them shriveled up and died. At least I managed to rescue four little tough guys. Speaking of tough, do you see what I see? These guys are living up to the spinosa part of their latin name. 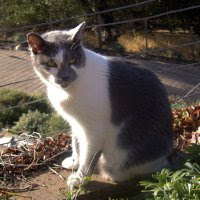 Thanks to Robert in Novato for swapping some of his Spanish caper seeds with me. He did a better job of nurturing the seeds that I sent him in trade. Here are some photos that he sent to me of the pink flowering and Croatian plants that he started. His pink flowering plants are even developing flower buds already. I think I could take some lessons from Robert about growing capers!